We offer several opportunities throughout the year for spiritual enrichment through small group discussions, book studies, DVD series, and classes. We try to offer a variety of meeting times and days to make it convenient for all who would like to participate. Adult Weekly Discussion Group: We have an ongoing adult discussion group that meets on Wednesday evenings from September through April in the Marian Room from 5:30-7pm, that covers a variety of Catholic topics. This group is facilitated by Donald MacArthur. You are welcome to come any week! Scripture Study (Men’s): Participants learn about the scriptures in a a small- group friendly atmosphere. We share our faith journeys through prayer and study of the Bible; building friendships while learning about Christ. This opportunity is loosely structured, following a study guide. Cost for the study guide is $7 – $9, available at the meeting. We offer several opportunities for groups to meet during the seasons of Advent and Lent. This is an excellent way to set aside time to reflect and prepare for the beautiful Christmas and Easter seasons. Seasonal enrichment sessions will be posted as those seasons get closer. “To know Scripture is to know Jesus” – We are hoping to form Scripture Study groups for women…mornings and/or evenings. Resources will be available at a nominal fee. The schedule and the setting will be flexible. This is a great opportunity to explore the Scriptures and share your faith with like-minded women. 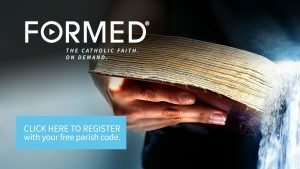 FORMED.org- Catholic studies, movies, talks and e-books for adults and children, in English and Spanish, all available to you on your own computer, tablet, or iPad, any time, anywhere. Free subscription through our parish! Click the picture to register an account, then just log in after that anytime to start viewing great Catholic content! We hope you will take advantage of one or more of these opportunities to deepen your faith and connect with members of your Parish Family.